“I’m doing fine,” Ronald Ebens told me on Wednesday, a day after the June 23 anniversary of Vincent Chin’s brutal murder, when I asked how he was doing. I finally got through to Vincent Chin’s killer to ask him about new information in the public records. I had contacted him several times requesting to talk. No answer. Finally, I made one more call in the hopes to catch him. He answered and remembered me. I immediately called back. It was an informal and quick conversation, but he answered my questions about his potential financial windfall. The documents revealed Ebens was the beneficiary of a friend’s estate that received a portion of a $4 million dollar personal injury settlement in 2013. Did Ebens get any money? “Nope,” said Ebens. He acknowledged his friend’s wife had received the huge settlement, in which the friend’s estate got 3 percent. But any significant money to Ebens himself? The estate of Vincent Chin, of course. 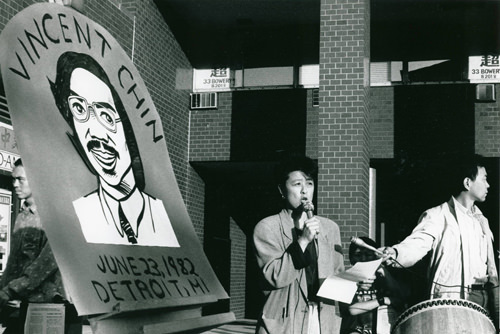 In 1987, a civil suit for the unlawful death of Chin was settled and Ebens was ordered to pay $1.5 million, representing Chin’s projected lost income as an engineer. Even conservatively estimating an income of $50,000 for 30 years, Chin’s life was woefully undervalued at $1.5 million. But Ebens has dodged payment by moving to Nevada, where he says he lives off his Social Security. Meanwhile, what’s owed to the Chin estate reached $8 million in 2012 and continues to grow with interest. According to sources close to the estate, Ebens actually did receive a token sum as a beneficiary, substitute plaintiff, and executor. The amount was as little as $10,000 for his involvement, which hardly makes a dent in what he owes the Chin estate. But at this stage more than three decades after Chin’s death, some still feel every penny should have gone to the Chin estate. Ebens has never held much regard for his financial obligation. “It was ridiculous then, it’s ridiculous now,” Ebens said in my 2012 interview with him on the matter. Ebens’ words drew the ire of author and activist Helen Zia, executor of the Chin estate. “It shows little or no caring, and a lack of remorse,” said Zia on Wednesday. But the writer activist didn’t stop there in my conversation with her. Zia thinks even the Boston Bomber has made a better apology than Ebens. For Zia, it’s a matter of Ebens saying exactly what he is sorry for. Indeed, the racial component was a key part of the case. Did what happen in the parking lot of the McDonald’s in suburban Detroit–when Ebens struck Chin twice to the head with a baseball bat–amount to a hate crime? Ebens was allowed to plea bargain from 2nd degree murder to manslaughter in order to escape prison time. The public reaction led to a federal prosecution of Ebens, who was found guilty of violating Chin’s civil rights. But that judgment was overturned on appeal, and Ebens was cleared of those charges in a subsequent trial. Ebens never served time in prison. And as far as the wrongful death settlement, in which dollars might bring a financial sense of justice, Ebens has managed to elude even that. Maybe Ebens is being straight with me when he says he never forgets Vincent Chin. But the public seems to forget even faster as the Chin story appears to fade with time. Even Zia admits, as a new generation passes, that what Ebens did to Chin seems to many like ancient history. But the iconic example of anti-Asian American violence happened in 1982. And given the Charleston shooting and xenophobic fears in a white minority America, it could certainly happen again. Thirty-three years and counting, as another anniversary passes, the search for justice continues. Asian Americans can ill afford to forget either the brutal death of Vincent Chin or the moral and financial debt still owed by Ronald Ebens.